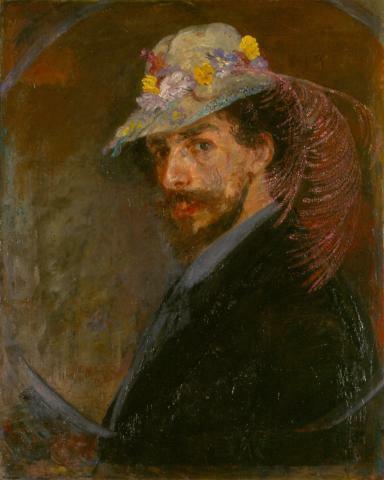 James Ensor was first and foremost a great individualist and nearly always began with himself in his art. Already searching for understanding and communication, the artistic calling was consequently the best conduit to the outside world. It is thus not surprising that the self-portrait, the self-mirroring, the artist and his attributes play an essential role in his oeuvre. There are few artists who so frequently and in so many different ways reproduced their own image. While in the early years he confidently sought direct eye contact with the viewer with the traditional self-portrait, he rather quickly reached for hidden self-portraits through the medium of identification and transformation. The identification with the tormented, tortured and crowned Christ, as well as the identification with death that constantly tormented him, was often given its turn. With a feeling for satire he transformed himself into a maybug or a hareng saur, or he would ensconce himself in the middle of his masks and his oeuvre. Until the very end he placed himself in question within a historical, social, artistic, political and familial context and drew in the viewer with this exchange of ideas.